The Kunsthistorisches Museum Wien owns the largest collection of paintings by Pieter Bruegel the Elder (1525/30–1569), among them his famous allegory of Carnival and Lent. 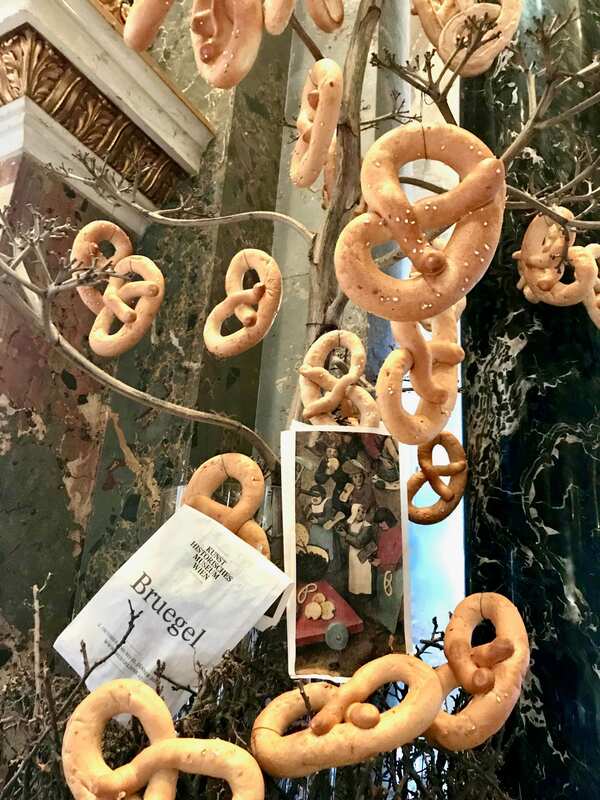 One of its “delicious” details has now been brought to life: on the occasion of the old master’s 450th death anniversary, the art event company DeliziArte has created the Bruegel Brezel for your culinary(t)y pleasure! What is the Bruegel Brezel? An edible pretzel inspired by Bruegel’s painting “The Fight between Carnival and Lent” that was painted in 1559. During Bruegel’s lifetime in 16th century Flanders, pretzels used to be a traditional fasting pastry. They can therefore be found on the right side of his painting that represents Lent and virtuous Christians. They are facing the feasting Carnival people and their vices on the painting’s left side. Unlike the pretzels commonly known today, Bruegel’s version is a non-leached pastry with bright color. Also the arms of the Bruegel Brezel are lapped instead of the widespread knotted pretzel arms. With the collaboration of the Viennese bakery Felber, DeliziArte has fine-tuned a pretzel that not only takes Bruegel’s aesthetics and the pastry’s history into account, but above all tastes delicious. One of DeliziArte’s main objectives is to create curiosity and joy in experiencing art. The Bruegel Brezel is meant to contribute to the pleasure of art experience by literally savoring Bruegel’s paintings. It shows a playful approach to the old master’s works and makes you confront his art more attentively. Having eaten a Bruegel Brezel you will certainly want to find it in the painting. Be prepared for a challenge, though, as the pretzel is but a tiny detail. Searching for it becomes a hidden object game. Where can I buy the Bruegel Brezel? With the opening of the Bruegel exhibition on October 2nd 2018 the Bruegel Brezel can be purchased at a price of €3 in the KHM Café & Restaurant, situated in the museum’s cupola on the first floor. You may enjoy it on-site, combine it with your favorite dish and drink or take it home. It always comes with a specially designed paper bag, depicting the referring detail of Bruegel’s Carnival and Lent painting. Where can I experience the Bruegel Brezel? Upon request DeliziArte offers private tours through the Bruegel exhibition with focus on the Brezel detail, followed – at your option – by a pretzel tasting in the KHM Café & Restaurant.